Guys, I have to tell you something. I NOW HAVE FULLER, MORE MANAGEABLE HAIR!! Seriously. That’s why I’m taking them. For my hair. And that’s the only reason. 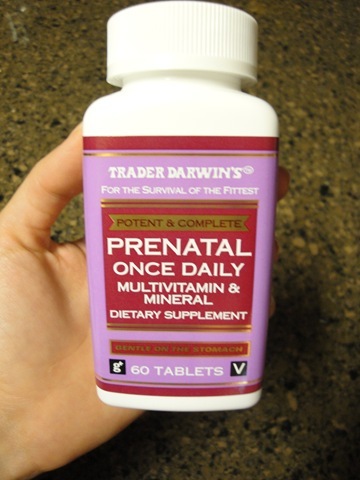 I was reading Mindy Kaling’s blog a couple months ago, and she does a series of posts called “Things I Bought That I Love.” One of the things she bought and loved was Trader Joe’s Prenatal Multivitamins. Mindy plays the hilariously shallow Kelly Kapoor on The Office, and her blog is quite informative and entertaining. Apparently Mindy’s hair stylist bought these vitamins for her, and they actually succeeded in making her hair more awesome. I decided to try them, and I’m pretty sure they work! I’m not ruling out the power of suggestion, but I think my hair has had a bit more life to it lately, so I’m going with it! And if you like to laugh and be informed of useful, fun products, I highly recommend Mindy’s blog. This entry was posted in You oughta know and tagged Carlie, Carlie Crash, hair, Mindy Kaling, prenatal vitamins, things I bought that I love, trader joe's by carlieblissirwin. Bookmark the permalink.